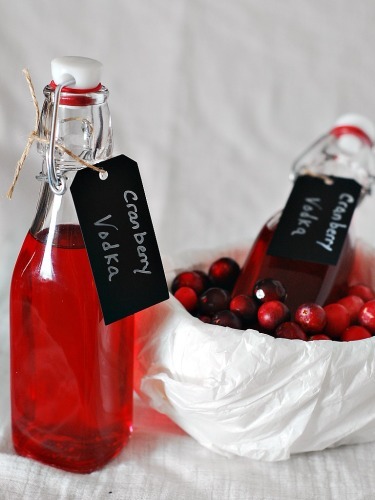 Some of the best recipes of the Christmas season are those that double as gifts, like this homemade cranberry-infused vodka! Thanksgiving has passed, now it’s time for the hustle and bustle of the holidays! Cookie swaps, Christmas parties, brunches with Santa, tree trimming, caroling (does anybody do that anymore? ), and on and on! It might sound like I’m complaining, but I’m not. Christmas is my favorite time of the year! This can also turn into the most expensive time of the year, with gifts for family, friends, and hostess gifts for all those Christmas parties. One way to trim those expenses is to make homemade gifts. Today’s #SundaySupper is dedicated to gifts from the kitchen. 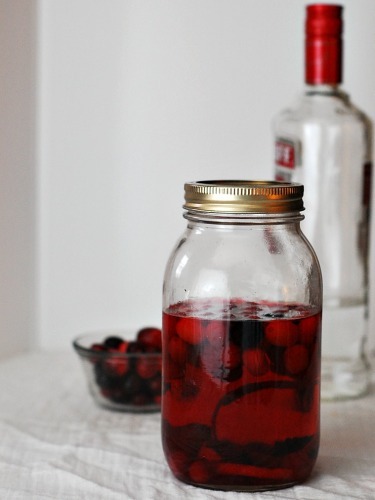 This gift is cranberry-infused vodka, a simple, seasonal and flavorful spirit. A mixture of cranberries, sugar, and orange peel are simmered until the cranberries burst, then combined with vodka until the flavors infuse. This takes a bit of advance planning, because you want to allow at least a week for infusing. The longer you leave the vodka to infuse, the stronger the flavor. Then strain into decorative bottles and add a festive ribbon and tag! Place the cranberries, sugar, and water in a medium saucepan. Cook over medium-high heat until the sugar dissolves and the cranberries begin to pop. Remove from the heat and allow to cool. Transfer the mixture into a large mason jar. Place the orange peel in the mason jar, and pour the vodka over top. Screw the lid on tightly and set the jar on a counter at room temperature for at least 3 days, and up to a month. Shake once a day. Strain into a decorative storage jar, tie with festive ribbon and gift with a cocktail recipe in which to use it. Don’t forget to check out the other #SundaySupper Gifts from the Kitchen! Oh my! That is SO beautiful! And I bet it is super tasty too. 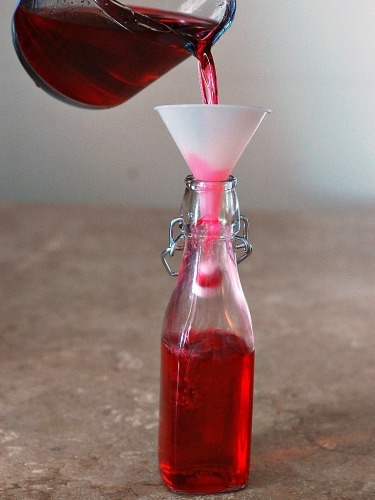 I love infused vodkas like this, I have made many but have not tried cranberry. Perfect gift for the holidays!! What a beautiful gift?! The color is amazing and I love cranberry everything at this time of the year. What a great gift idea! Though I’d like to make some for myself! the color of this is so vibrant and inviting. It would make any cocktail so festive! Whoa! How festive! I’m positive your gift recipients are going to be VERY happy with this as a gift from you! Cranberry and vodka- yes please!!!! What a fun and fantastic gift idea! I love this! 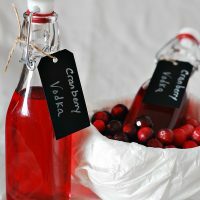 I made a batch of cranberry vodka last year and kept it around for the entire season, so perfect! This looks amazing! I’d love to drink it with some orange juice! I like the idea of cooking the berries first. i’ll have to try this method also. I never knew it was so easy to make! What a great idea! The color is so festive! When cranberries went on sale after the holidays, I got inspired to test this out in advance for Christmas 2017 . It’s super easy, very tasty and visually appealing. Sam’s Club has a solid Members Mark vodka at a great price, and Michael’s craft stores have lovely 2-cup tight-sealing containers. I’ll use their coupons all year to stock up on those. They also sell large mason jars so you can double the recipe. I’m looking forward to Christmas already. Thanks, Red! Do you need to cool thto cranberry mixture before you pour it into jars? Yes, thank you for pointing out that I neglected to include that!